Enjoy a quiet drink on host's spacious terrace, whilst watching industrious Mahali (weaver) birds build their nests or simply savour the colourful skies of the African setting sun whilst sharing an aperitif between friends. 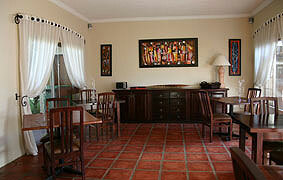 Alternatively, quench your curiosity about Africa and this beautiful country with books from host's mini library. 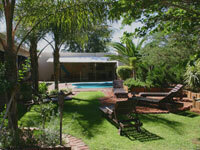 Cool down in host clear pool and absorb some Namibian sun on the comfortable lounges in the garden. 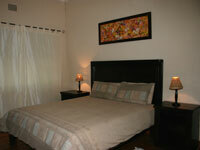 All of host 8 en-suite and fully equipped rooms are each individually and tastefully decorated. After a good night's rest, enjoy a sumptuous breakfast. 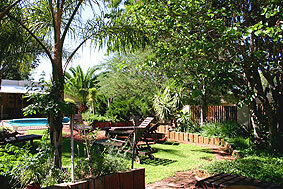 Experience typical Namibian friendliness and the unique French charm of your hostess, Londiningi is your home-away-from-home in Windhoek!